Family history lives in these yellow blooms and the tightly curled purple buds beyond them. Layers and layers of family and stories. One of the main reasons I love teaching my workshop, Saving Grandpa’s Stories–and Grandma’s too! is because I grew up with stories. History isn’t only made by people in history books; it’s made by ordinary people living ordinary lives and telling the good parts. 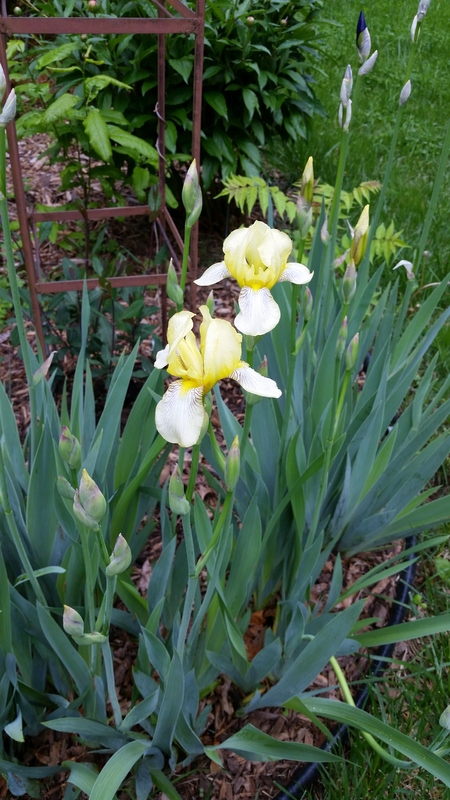 The yellow iris are from my father’s mother, Grandma Sunderland, via Cousin Linda’s garden who got them from Grandma. Grandma Walt, we called her as her husband, our father’s father, was Grandpa Walt. Grandma and Grandpa Walt. That’s how it was. She had a first name but we never called her that; in fact, her first name is my middle name and since Grandma’s name was a secret, my middle name is secret. I never use it, not even the first initial. We’ve had buckets of rain lately so the garden is voluptuous. Stuff is blooming everywhere. And then it gets sunny and hot and stuff explodes. We’ve had heavy thunderstorms, gloriously noisy affairs. Last night alone we got just short of two inches. I think of Dad, standing at the edge of the yard fence, looking out over the west fields and watching thunderheads form. In the spring, tornadoes were always a possibility, but our homestead on a rise so we could see ten miles in all directions. I hated the thought of having to dive for the old and dank and cobweb strewn cellar if he thought it necessary. But tornadoes prefer flat surfaces and draws to climbing any kind of hill, so tornadoes, as a rule, ran off around the south side and down a draw where they tangled in pasture woods. Dad was a story-teller. Stories were always a good reason to take a break and lean on a hoe or a tractor tire. One of his favorites was telling about the times he hired Lawrence Welk’s band to play for dances on a wooden platform in the pasture at the end of our lane. Dad was my father after my first father died. He married a widow with five kids and brought us to the farm. He was short and dark, his lineage Bohemian. And he loved to polka. It has just occurred to me I’m repeating my mother’s story: for my second husband, I married a Polish man about the same height as Dad, who dances a mean polka, whose hair was originally dark, and who tells East Baltimore and Patterson Park stories. How do we ever make sense of our lives when we’re such a bundle of used-to-be stories? Along with the iris, which I cut and bring into the house because their heads are so heavy, the rose bushes are loaded, the stems heavy with bloom, and the peonies from Cousin Howard’s yard are covered with heavy, plump buds. There will be peonies a plenty for Memorial Day. I had no idea I looked like Grandma Sunderland. I knew I baked bread and biscuits like her and rolled out dough like her. I’ve never been able to duplicate her sugar cookies although I’ve tried. My hands look like hers although she’d had two middle fingers chopped off at the first joint when a young teen by an errant hatchet aiming for a chicken’s neck. I used to bite my nails and I’ve certainly banged up my hands on more than one occasion, but I have all my fingers. The purple buds among the yellow blooms are from my mother’s father, Grandpa Joe. He tended iris and roses and apple trees and cherry trees and an expansive vegetable garden in our backyard in Barnes, Kansas where we lived from the time I was four to nine. Railroad tracks ran at the back of our long yard. Grandpa was the depot agent. A chicken house with chickens sat at the edge of a ditch before the ditch rose to the tracks. The ground was built up so high for the tracks, evenly spaced and wooden ties-shored tunnels ran under it. We’d stand in the ditch and dare each other to run into the tunnel as the Missouri-Pacific thundered past above our young heads. It probably wasn’t running as fast as we thought, however, because the depot was only about three blocks further on. But those engines, which still belched smoke when I was a kid, were huge and heavy and loud. I remember kids putting pennies on the track but I never did. I worried it would derail Grandpa’s train. And we’d been warned often enough to stay off the tracks. Grandpa Joe also had a special spot in the shade under one tree near the house where coffee grounds got dumped. That was so worms would come and make a colony and my father could find them with only a brief dig to go fishing. The preacher, Bob, who’d known us forever, told a story about the garden and chickens at my mother’s funeral. He remembered when the chickens got loose and into the garden’s garlic patch, and mother fried up garlic flavored chicken for weeks. I tried that once with fresh garlic in the flour and pan before cooking. My sons were not impressed. Mom’s garlic chicken is still their story when we’re together. “No garlic chicken!” they say. Grandpa Joe’s purple iris smelled exactly like grape pop. You can’t find that kind of iris at a nursery. But a farm neighbor I visited one day dug up bags full of tubers for me and now I have Grandpa Joe’s grape-pop purple iris. Who am I in this trail of flowers and weather and bird song? Life is like writing: the good stuff is in the revision process. I can keep track, more or less, of personal revisions and renewals, but it’s a long list. And now I’ve recreated childhood. The house we live in looks like Grandpa Joe’s house in Barnes, and if you’d cut it in half, long ways, it would look like the Baltimore row home Cliff grew up in. The metal frame you can sort of see behind the iris is a metal shelf from his mom’s place. Much of our furniture is from that Baltimore row home, which we brought back here after Mom sold the house and moved into a senior’s apartment building. Cliff tells stories of his brother banging into the Duncan Fife china cupboard corners as he dashed from room to room. We have a small cupboard his grandfather, Dziadz, Polish for grandfather, built. Our home is filled with stories. Every painting, every piece of art, every photograph on our walls (and we have many) comes with a story. The sky’s been clouding up again as I’ve written, sitting at the wide front upstairs window with a Romare Bearden quote taped to the sill: Artists are like mice. They need old houses where they can roam around and nobody bothers them. We have that kind of house. The kind of house a child might draw: peaked roof, front door flanked by windows, a tree out front. Across the bottom of the drawing, I’ll write, Honey, I’m home. This is a really beautiful story. What a kind post to find in my inbox. Thank you, Brian. Janet, you writing is so lyrical and poetic and full of the lives of your family. I can imagine you in your kitchen recreating your grandmother’s recipes. I would love to see more of your flowers, too! What a kind thing to say, Terri. Thank you so much! As soon at the peonies burst free, I’ll post a shot. Wonderful collection of family stories and your re-inhabiting ancestral spaces. Like good stories they remind the reader of something in their past. In my mother’s small Alabama town the Southern railway trains barreled through several times a day. When I visited my relatives as a child, my siblings, cousins and I put crossed straight pens on the track for the trains to make miniature scissors. Wow. I’d never heard of crossed straight pins! Did they work? I’m so glad the essay brought up your own family memories. That’s very cool. This is a masterful recollection, Janet. It is as if we sat down to talk and reminisce about nothing in particular, but meaningful things none the less. I look forward to more stories from the old house and the surrounding neighbors. Thanks so much for your kind comment, Allan. As a matter of fact, I’m going to visit my 2nd Grade teacher in a couple of weeks. No doubt that will lead to another essay. She saw a county made video from a presentation I made and called the extension office for my information. A second grade teacher. Mercy. She started teaching with teachers training straight out of high school and is now in her late 80s. Folks in Kansas have a habit of living a long time…. I hope that the visit with your teacher is as special as mine was last year when I met my high school English teacher after a 50 year absence. Thanks, Allan. I expect she’ll have lots of stories. I was astounded to learn she’d kept all the class year books of all the classes she taught. So looking at my 7 year old self is going to be interesting. I’d like hearing what your English teacher had to say. Ah, the memories all make great stories. I like that most or all of your flowers came from close relatives. Thanks so much. I’ve propagated so many that I’ve taken roots up to the farm and have started a garden there too. Peonies and iris. The country cemeteries are full of those at this time of year. We’ve had so much rain, I’m hoping they will still be blooming by the time we make the cemetery runs later this month. Truly, you don’t need a weatherman to know the way the wind (of the family spirit) blows. All you need are some flowers, a sky, a few other people who remember, and a willingness to take the time to do so. Lovely entry. Thank you. What a kind response. Lemme tell ya, Gal, we got flowers and sky in this here land! It’s been such a joy to have them in my own backyard and I smile each morning when I look out the window and have my first cup of tea.